Leroy with Larry Calame Larry Calame passed away from a heart attack recently. Larry was from Albuqueque, NM, but that didn't stop him from being with longtime friend, Leroy Beddingfield, at many non wing races over the years. Larry was a Wagtimer for a long time and would often be seen at the Copper World, or Perris or in Indiana watching the sprints with Leroy and visiting with many along the way. 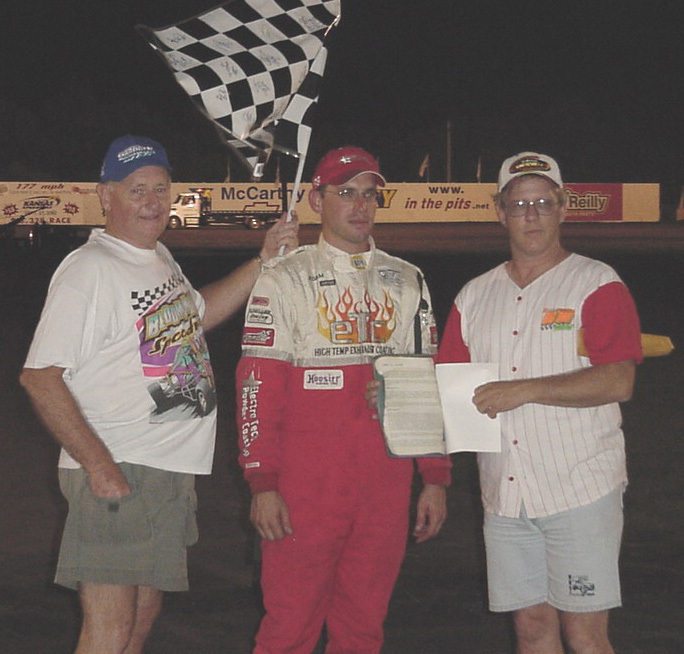 At Lakesdie Speedway during the 2002 NWWC Tour, Leroy and some of Larry's close friends paid tribute to him by collecting and awarding over $500 to Adam Mitchell when he missed the main on the first night of the two day race. A touching prose was also presented and is below the following picture. The following is from Ken "JD" Cormack and Leroy Beddingfield: On 06/23/02 Dedicated "Open Wheel Racing" fan, Larry Calame crossed his own finish line into heaven. 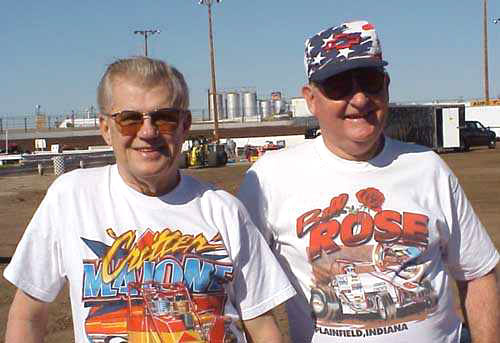 Larry would gather friends to travel to races all across the United States and with friends such as Leroy Beddingfield at his side, not many races were held that these two were not seated in the stands. Larry B. "Papa Bear" Calame, 69, was a resident of Albuquerque, N.M. since 1951. He is survived by his wife of 48 years, Bernie Calame, Daughters, Doyln Jones and husband, Joey, of Phoenix, AZ., Brenda Williams and husband, Greg, of Albuquerque, N.M., a grandson, Jerrett Williams and granddaughter, Kyleigh Williams. Larry proudly served in the US Navy during the Korean Conflict. He worked for the Frisco Railroad and then for TWA for 39 years. After retiring he worked for Spa and Billiards World. Not only was Larry a PROUD husband, a father and grandfather, and friend, but Larry had a soft spot in is heart for those in need. He was a founding member of the World Wide Race Fans, Inc. which gives to those in need. Larry loved to travel, tell jokes, and shared many racing stories. He could "hold court" from California, Indiana, Missouri, Iowa to Nebraska and Oklahoma. As an avid race fan, he was especially excited about the old CRA/SCRA (Southen California Racing Association). 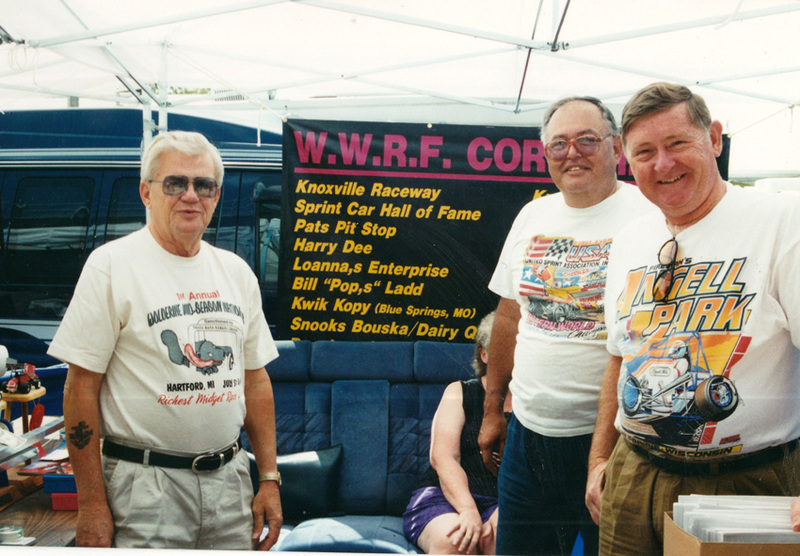 Larry was 1/3rd of the famous "Traveling Senior Race Fans" of Larry, Dave More and Leroy Beddingfield. Those that never met this group missed some awesome stories and a great friendship. Those that did, well they are right up there with some great drivers of the past and present. We would like to express our deepest prayers to the wife and family of Larry along with our words of support to help through this time of sorrow. Thanks to those that contributed in Larry's memory. Thanks to the lord above for allowing those of us out here the opportunity to have crossed paths with Larry.